The Bachelor of Architectural Studies is the first step for a future career as a professional architect. 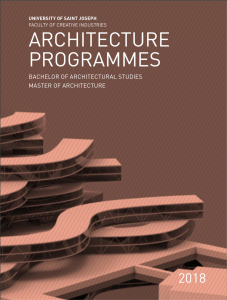 The Bachelor of Architectural Studies enables students to develop creative abilities, technical skills and professional knowledge holistically, establishing a solid foundation to pursue a career in architecture in Macao and internationally. As the first and only architecture programme in Macao, the curriculum was designed to follow international standards of architectural education while exploring the specific conditions of our location and cultural context. The curriculum is rooted on tectonics and sustainability, addressing four main themes: high-density housing; heritage management and conservation; experimental material fabrication; innovative mixed-use architecture. The programme emphasises ethics as well as expertise, encouraging students to be socially committed and generous, designing for the common good. Students should have a strong interest in design and the built environment. A portfolio of creative work is required for application to the programme. Macau is the most densely populated territory in the world, a vibrant and ever changing city with a unique history of cultural exchange, an inspiring and fascinating place to study architecture. As the first and only architecture programme in Macau, our curriculum was designed to follow international standards of architectural education while exploring the specific conditions of our location and cultural context. The curriculum is rooted on tectonics and sustainability, addressing four main themes: high-density housing; heritage management and conservation; experimental material fabrication; innovative mixed-use architecture. Our programmes follow an idealistic yet pragmatic approach, looking to Macau and the Pearl River Delta as a laboratory to imagine and test new spatial answers to contemporary challenges and opportunities. We encourage students to generate innovative and original architectural and urban forms, designed from the public perspective, taking the potential of its program and the connection to the existing context as a starting point to create vibrant future realities. The University of Saint Joseph architecture programmes emphasize ethics as well as expertise, encouraging students to be socially committed and generous, designing for the common good. We strive to form innovative and skillful architects committed to contributing to improve the future of or citizens and cities by improving the design of the daily spaces where human activities take place. This module ensures that all students have the conceptual and technical knowledge and have had adequate practice to competently sketch in both two and three dimensions. This module explains the theory and practice of sketching and interpreting views of three dimensional objects, including prespective, isometric, orthographic and other projections and sectioning. It also introduces students to technical standards in engineering drawings, including the specification of symmetry; dimensions, surfaces and tolerances; chamfers and blends; sections and standard parts. Students work through a structured series of problems to sketch increasingly complex objects and interpret complex drawings, including the calculation of feature dimensions based on geometric analysis. This module will encourage students to see, think and speak in the visual language of three-dimensional models and art. Students will concentrate on the application of three-dimensional concepts, through the direct manipulation of materials using a broad approach to tools and processes. Although this is a studio course module focusing primarily on specific projects and group critiques, in an effort to develop critical thinking, a portion of time will be spent on slide lectures, films, readings and discussion. Some time will also be given over to the safe and proper use of hand tools, power tools and equipment. The module considers both hand worked (clay, polystyrene, balsa wood, MDF, etc)and machine made (stereo-lithography, etc) models. As part of the module, students hand made models for at least two different products and one machine made model. This module reviews selected historically important and influential theories, stategies and approaches to art and design. These are put into historical context to consider trends and evolution in the design field. Examples are drawn from a broad spectrum of design fields, including architecture and decorative arts, painting, sculpture and glassmaking, consumer and automotive product design, industrial machinery and clothing. Consideration technology, ergonomics and social context. As part of this module, students will work to create designs for selected objects that are consistent with different design movements. This module introduces students to the concepts and techniques of computer-based software tools used to draw images and construct virtual models of two- and three-dimensional objects and spaces. Line (wireframe), surface, and solid modeling will be studied. The constant drawing practice will make a strong contribution to new approaches in the creative process as witnessed in the sketchbooks, diagrams and sketches. This activity must of times is a tool that precedes others, such as Painting, Sculpture, Design, Architecture as well as many other disciplines in Science and Engineering. Topics will be discussed through case studies and students will learn and understand important concepts of thinking through class and group discussion. innovation is essential in the creation of good design and outstanding communication, and it is contemporarily acknowledged as a competitive advantage to a wide range of activities and organizations as a way to increase both performance and productivity. This is the first of two modules that review and introduce important topics and theories in mathematics that are relevant to everyday science and engineering. In this module selected issues in Arithmatic and Number Theory; Algebra and Systems of equations; Trigonometry and Coordinate Systems; Functions and Series; Calculus and Partial Differential Equations are considered. In all cases, “real world” applications of mathematics are emphasized. This is the second of two modules that review and introduces important topics and theories in mathematics that are relevant to everyday Science and engineering. In this module selected issues in Complex Number Theory; Vectors; Matrices and Field Theory; Graphing; Curve fitting and Approximation; Surfaces; Centroids; Moments and Multiple Integration and Laplace Transforms are considered. In all cases, “real world” application of mathematics are emphasized. This module introduces to basic aspects of structural design and construction technology. The lectures will progressively introduce structural principles relevant to architectural design and building construction; introduce a framework for understanding the properties and environmental impact of fundamental building materials and how they are used within the construction industry; introduce case studies of reinforced concrete buildings and other structures to help students develop an intuitive understanding of structure and materials. Environmental issues relating to architecture and building construction are emphasized. This module is an introduction to architectural principles and processes, comprising a sequence of exercises emphasizing the development of basic skills, ideas, and techniques used in the design of simplified projects. It forms a comprehensive introduction to the foundation studies of architecture, addressing the issues essential to the training of an architect. The aim is to develop architectural literacy, improve critical and analytical skills, enhance visual, spatial, and conceptual sensibilities with emphasis on the presentation of ideas, concepts, and present designs in visual and verbal formats. Revolution through to the emergence of Postmodernism. Rather than a unified movement, Modern architecture will be treated as the outcome of a complex constellation of formal, theoretical, social, cultural, technological, economic, and political forces. Throughout the module, students will examine two key influences on the development of Modern architecture: the material effects brought about by technology and industrialization, and the ideological ambitions arising from utopian legacy of the Enlightenment. The focus will be primarily upon the European avant-garde, though architectural developments in North America, Asia, and elsewhere will also be covered. This module will examine computer-based parametric design systems and their applications and implications for architecture. Through a series of lectures and guided design exercises, students will be introduced to the theoretical background of parametric systems and their usage in practice. Historical precedents of specific architectural typologies will be examined to initiate a critical dialogue between physical constraints and digital design. 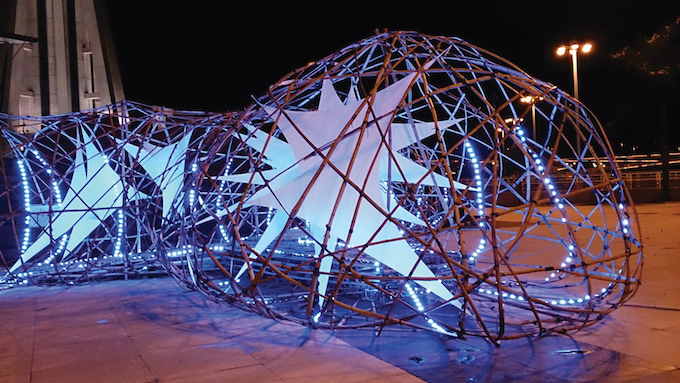 Various techniques will be deployed in order to generate parametrically driven prototypes with the capacity to produce innovative architectural structures. Continuing from Architectural design I, this module forms a comprehensive introduction to the foundation studies of architecture, addressing the issues essential to the training of an architect. Using small building design projects, the aim is to develop architectural literacy, improve critical and analytical skills, to enhance visual, spatial, and conceptual sensibilities with emphasis on the presentation of ideas, concepts, and to present designs in visual as well as verbal formats. This module provides a comprehensive introduction to 3D digital media and methods for architects, with an emphasis on BIM (Building Integration Modeling). BIM is a method used to create a database for an architectural project that contains a 3D building model, formal project documentation, and other information related to architectural design, structure, and MEP (mechanical, electrical, plumbing). This database is a source of current information about building parameters and physical performance, constantly updated throughout the design process and building lifetime. Examples will be based on case studies that are complex and innovative in terms of design, modeling approach, and project management. This module addresses the static and dynamic analysis of structures. Students will learn how to model, analyze, and predict the behavior of structural systems. The relationships between load carrying mechanisms and various structural and architectural forms will be explored, and case studies of significant structures will be discussed and analyzed in relation to architectural planning and design processes. By the end of the module, students should be able to approach an unfamiliar structure and develop a mathematical model that will adequately predict its performance relative to its intended usage. This module focuses on environmental and spatial considerations with emphasis on the integration of building technology in design and the use of digital media in conceptualizing and presenting design ideas. The module aims at developing an awareness of building within community environments, and the ability to apply a distinctive architectural language. Particular attention will be paid to architectural character and context. In this course students will explore the evolution of Macau’s built environment. The course will be organized as a field-based study of the buildings, neighborhoods, and logics inherent to past and current city planning in Macau. Special emphasis will be given to the study of UNESCO-designated world heritage buildings. This module introduces students to a range of advanced construction approaches and techniques. These include the technologies that are important for environmentally sustainable and sensitive buildings, and for managing the ongoing internal situation of buildings so as to minimize their environmental impact. In particular, it will provide the technical knowledge necessary to design, detail, specify and construct building enclosures. Case studies of historical as well as contemporary examples are used to illustrate the technical content of the module. This will provide students with a comprehensive understanding of the technical concepts as well as the specific skills necessary to undertake the detailing and specification of a curtain wall. Macau provides an ideal context to investigate the challenges and opportunities of sustainable urban design and some of the opportunities and techniques that will alleviate the environmental impact of urban development, with particular attention to the Pearl River Delta region. This module will introduce relevant theories, concepts, methods, and tools. Students will learn ways of organizing territorial-based information, while gaining an awareness of the importance of geomorphological processes and related risks. Topics will include the urbanization process, cities and globalization, differentiation and functional dynamics of urban space, spatial economy and land use, cities and social differentiation, urban ecology, urban landscapes, environment and heritage. Continuing from Architectural design III, this module focuses on environmental and spatial considerations with emphasis on the integration of building technology in design and the use of digital media in conceptualizing and presenting design ideas. The module aims at developing an awareness of building within community environments, and the ability to apply a distinctive architectural language. Particular attention will be paid to architectural character and context. This module explores the basic ideas underpinning contemporary approaches to heritage conservation. The meaning of heritage and the value of conserving it is considered, along with the different schools of thought and the most widely adopted approaches to conservation. As well as the adaptive reuse of structures and public spaces, the role of memory, cultural identity and tradition in maintaining heritage buildings and sites will be examined; community participation on heritage projects and management; analytical concepts for the impact of new structures in heritage sites; concepts of mapping heritage. This module will address technical aspects of illumination and acoustics in buildings will learn about the ideas, problems, and potentials related to the design of buildings in response to the luminous and sonic environment. Students will explore the design implications of structural systems, particularly in the case of large-scale buildings. Special attention will be given to experimental structures and materials. The course aims provide students with an appreciation and understanding of the behavior of both horizontal spanning as well as vertical structures. The relationships between load-bearing mechanisms and various structural and architectural forms will be explored and case studies of significant structures of these types will be discussed and analyzed in relation to architectural planning and design processes. Structural aspects of site investigation, foundations and retaining structures will also be discussed within the context of relevant case studies. This module explores approaches and techniques for interior design and furniture. Examples from different genres and parts of the world are analyzed to identify their strengths and weaknesses from different perspectives, including aesthetic, stylistic, cultural, ergonomic and usage patterns. Students also work through a progressively more complex series of interior design and furniture projects, according to a speculative design brief. This module emphasizes the development of design skills that allow students to organize buildings of medium within a social and economic framework, particularly in the environmental context of Macau. The module is focused on a comprehensive design project, with supplementary design exercises. This course examines the discursive issues that affect architecture and the built environment today. Emphasis will be placed on understanding contemporary challenges in architectural practice and theory and their origins in the continuation, diversification, and transformation of the modernist tradition over the course of the last century. Major issues to be addressed include the relationships between architecture and its global-local context, the digital revolution, the conservation of urban and cultural heritage, public housing, sustainability, and the complex relationships between architecture and other disciplines. This module addresses techniques and approaches for the sustainable design of buildings. Reuse and recycling of building elements are examined through real case studies. The strategies, approaches, and technologies available to minimize consumption of energy, water, and other resources are also examined. The module will explore the latent potential of these different systems (whether natural or artificial), and how they affect and are affected by the built environment. Through interactive discussions, students will learn to apply design strategies for greener buildings and also be made aware of the sustainable evaluation systems, criteria, and methods for building performance evaluation, such as LEED and BREEAM. Case studies relevant to the situation in Macau are used to illustrate these concepts and technologies. Continuing from Architectural Design V, this module emphasizes the development of design skills that allow students to organize buildings of medium within a social and economic framework, particularly in the environmental context of Macau. The module is focused on a comprehensive design project, with supplementary design exercises. This module introduces students to the scholarly study of the city, from ancient Greece to contemporary China, understood as an entity shaped by dynamic and changing cultural, industrial, political, and social processes. Case studies will be examined in coordination with important concepts or methodological concerns. The module uses readings of critical theories, analysis of developmental models, as well as empirical investigation of urban sites. Topics covered include the origins and history of urban planning, legal aspects of planning, sustainable development, metropolitan growth and urban sprawl, housing and real estate development, transportation, environmental planning, historic preservation, brownfield redevelopment, waste management, and third world development.